South Korean developers may be backing down from plans to erect two luxury apartment buildings that some say resemble the World Trade Center buildings exploding as they were hit by planes on 9/11. "There is nothing finalized about the design," Seo Hee Seok, a spokesman for Yongsan Development Co., told Bloomberg Tuesday. While arguing that the design was "widely published" across Asia without any objections or people noticing the resemblance, the company said the project began to receive negative publicity once it was publicized in the U.S.
Until today, developers had said the building design pitched by Dutch architecture firm MVRDV would be erected in Seoul, South Korea by 2016 without any revision or change. "Allegations that [the design] was inspired by the 9/11 attacks are groundless," White Paik, spokesman for South Korean Yongsan Development Corp, told the AFP. But some say there's no mistaking the association. "It looks like when [the World Trade Center] began to collapse -- it collapsed from the center down," Filipo Borsellino, a firefighter, told DNAinfo.com. Jim Riches, a retired firefighter, who lost his son on 9/11, agrees. "It looks just like the towers imploding," he told the New York Daily News. "I think they're trying to sensationalize it. It's a cheap way to get publicity." MVRDV regrets deeply any connotations The Cloud projects evokes regarding 9/11, it was not our intention. 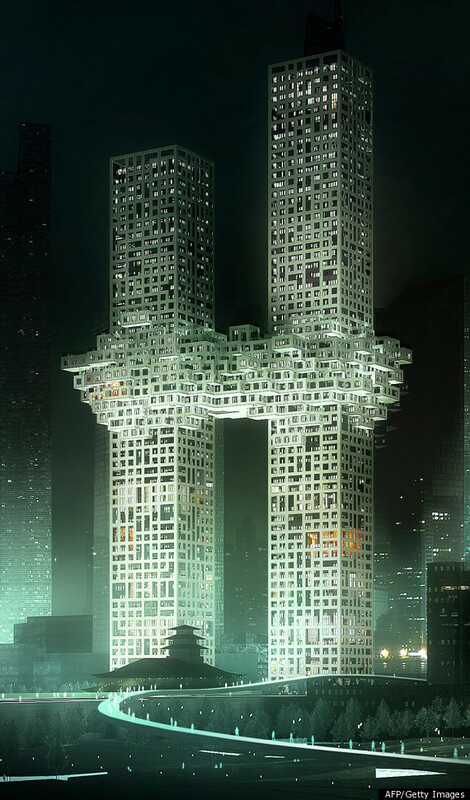 The residential towers, after all, are supposed to be built at the entrance to the so-called Yongsan Dream Hub: a complex of business towers that has been designed by none other than Daniel Libeskind, the designer of the original "master plan" for the reconstruction of Ground Zero. ... Libeskind's Yongsan Dreamhub "master plan" closely resembles his original "master plan" for lower Manhattan. While some say the building's design has an uncanny resemblance to the World Trade Center attacks, others say they didn't make initially make the connection. "It looks that block game," Brooklyn resident George Ralph told DNAinfo.com. "I could see how it looks like the World Trade Center, but it wasn't my first reaction." HuffPost user LibertariansGhost writes: "It evokes images of Sept. 11 to those seeking to find images of Sept. 11. No different from finding the image of the 'Virgin Mary' or the face of Christ in a puddle of spilled milk." To which user qthedancer responded: "Too true. I didn't even see what could have been meant by 'awkward resemblance' until I had it pointed out to me in the article." The building's central cloud formation was designed to connect the two luxury towers with a pool, restaurants and sky lounges.